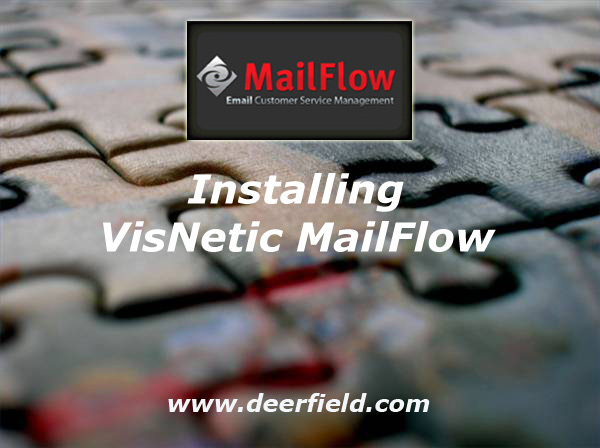 So you've heard all these great things about VisNetic MailFlow, and how it can help manage your customer service email, and you would like to give it a try. The first question is "How difficult is it to install?" The answer to that question requires a bit of qualification. The computer MailFlow will be installed on must meet minimum System Requirements. With that in mind I've created a short video describing the install step-by-step. In as little as 10 minutes you can have email flowing in and out of MailFlow. Have questions? Drop us an email at sales@deerfield.com or give us a call at 989.732.8856. We can arrange a Personal Demonstration to help put it all together.